Welcome back amigos! Today's financial literacy article deals with the costs of raising a child to the age of 18, and how to avoid failing to procreate out of sticker shock, so to speak. I'm all for you feeling completely financially comfortable about bringing a new human into this world. It makes total sense to crunch some numbers beforehand with your significant other before "going for it." At the same time, planning for a baby monetarily should not lead to discouragement. 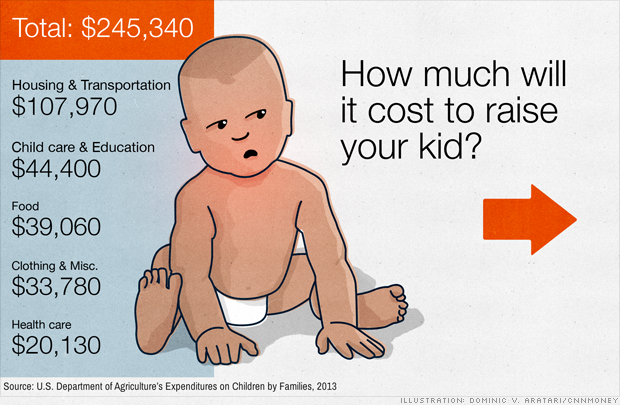 According to the U.S. Department of Agriculture, the average cost of raising a child born in 2013 to the age of 18 was $245K! And of course the figures are higher nowadays. I think the numbers are ridiculous, even when taking other factors into consideration like where you reside, a family's income, and whether or not you have other children. Is it possible to spend this much money on a child from birth to the age of 18? Of course! Some parents will spend even more. But let's face it, more than half of us would never keep a child clothed, fed, and alive if we had to shell out that kind of money. That being said, here are my tips for parents who, like me, hate being part of a statistic. 1. Make sure your wife has a baby shower. Your wife should select her most social friend to organize the shower so scores of women can be in attendance. Have your wife ask for diapers ranging from newborn to size 3. Babies poop the most during the first three months of their lives. Probably not a scientific fact...just going off experience here. Anyway, diapers are super expensive so forego on asking for clothes and get as many free diapers as you can. Trust me! 2. Use cloth diapers. So once you run out of free diapers from the shower, have cloth diapers ready to go. According to my mom, I used nothing but cloth diapers as an infant. Of course, we lived in Mexico at the time and it was the 70's. I hear cloth diapers have staged a comeback. I also read somewhere that it will take on average 8,000 diapers to fully potty-train a child. The cost: $2,500! There is an upfront investment fee when buying cloth diapers and brand selection is key, but if you do your homework, you'll save on one of the most expensive early costs of raising a child by going with cloth. 3. Get clothes from mothers with older children. Where on this planet does it say you have to buy your newborn, infant, toddler, or small child brand new clothes? You know how my mom did it? She got hooked-up from her friends and older sisters with kids of their own. Your child grows like a weed. If you are going to Oshkosh B'gosh or Baby Gap every time they grow out of their clothes you will undoubtedly pay $245K or more in child rearing costs by the time your kid is an adult. Besides, kids don't even care about their looks until they start elementary. And even then, their opinion doesn't count! No friends who can give you hand-me-downs? Go to the nearest consignment store. 4. Eat at home. America has become a nation of big name casual restaurants and eateries. Back in the 80's there was no Chipotle Mexican Grill, or PF Chang's, and other eateries we frequent weren't as ubiquitous as they are today. Going out to eat with the family is fun and all, but it should only be done on special occasions, like a birthday or anniversary. Why are Americans obsessed with dining out? Save money on feeding your children by cooking dinner at home! Hello! Kids need you to talk to them at the dinner table anyway, not be looking at the sporting events going on all around you. 5. Ever hear of bunk beds? Everybody wants to up and leave their small and humble abode as soon as the pregnancy stick shows a positive result. It's an excuse to go out and buy a bigger home and you shouldn't follow the herd mentality. Housing is the largest expense for families. If you have a 2-bedroom home and you're expecting a second child, do what poor families have been doing for eons...have both children sleep in the same room! This every child must have their own room syndrome is totally a middle-class thing. Heck, I had to share a room with my older sister until my mom told me it was time for me to move my bed into the garage. You can put two and two together there. 6. Don't save for college. If you have a child this year (2015), the cost of raising a child to the age of 18 will be substantially more than $245K if you factor in saving for future college expenses. Instead, have your child start working in high school, save his or her money, and go to community college. They can be part-time students at community college, save money of Gen Ed courses, and continue working. When they are ready to transition to a 4-year school, they will have saved up some cash, and will not need as many loans. Will they have college debt in the end? Of course. Sadly, there's no stopping the juggernaut that is the syndicate we know as higher learning. Okay, as you see from above there are ways you can avoid racking-up over $200K on raising a child to the age of 18. Look, no way, no how, poor people have that kind of money. So how do they raise children to the age of 18 with a lot less to work with? Poor people hacks like the type I've shared here! Thanks for reading. Until next time.